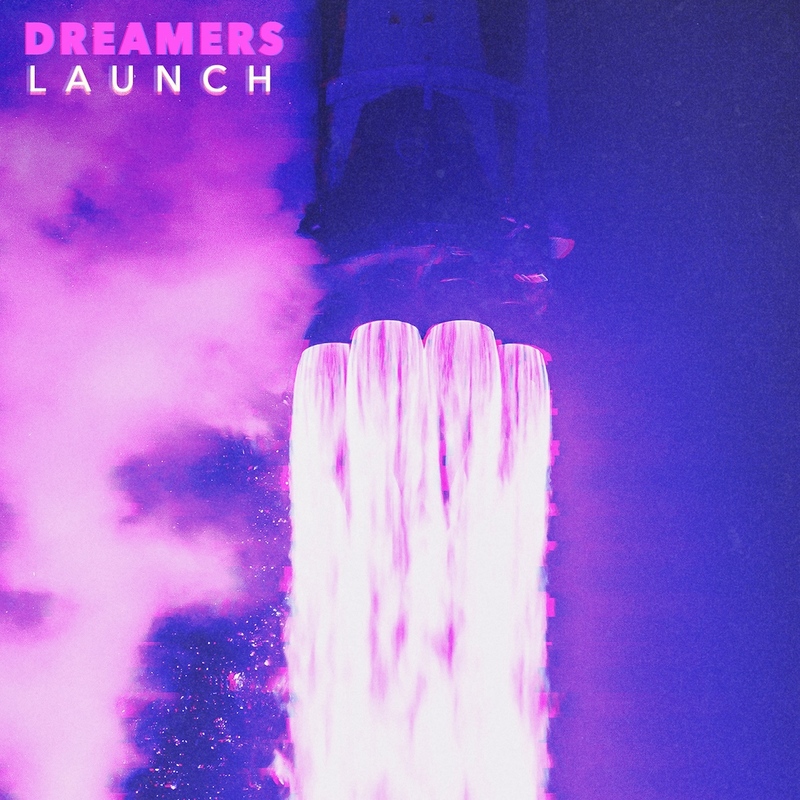 DREAMERS bend genres with new EP ‘Launch,’ a compilation of stories just waiting to be told. Naturally weaving genres throughout a body of work is an effort that often can come off as insincere and clunky. However, when executed accurately, it can produce a brilliant blend of sounds and feelings that introduce listeners to a new kind of band – a band that doesn’t necessarily fit into a specific genre, but instead one that is entirely and unapologetically itself – and in that, different genres are born. Such is the case for up-and-coming Los Angeles band DREAMERS, who seamlessly weave between the pop/rock spectrum in their new EP, LAUNCH (out now via Hollywood Records), ripe with stories needed to be told. “SCREWS,” the first song on the EP, sets the tone with a dreamy pop/rock vibe. “SCREWS” dives into the complications of feeling stuck in a relationship that is toxic. As lead singer Nick Wold puts it, “It was written from the perspective of still being stuck in a bad relationship – that feeling of your mind coming apart at the screws.” It’s a metaphor that brings grit to an otherwise intangible feeling. Distorted yet pleasant guitar riffs break up lines of the chorus, allowing us to digest the words. This heartbreak anthem has a nostalgic feel, while still being uniquely DREAMERS. Wold’s voice cuts through with a believability that allows you to feel what he wants you to feel. The track starts the EP off with a bang, leading to it’s second track – the bop of the album. “Fake It Til You Make It” tailors back a bit on the rock and brings forward the pop aspect of the band. While still very much rock at their core, “Fake It Til You Make It” is driven with a funky bass line, sweet guitar licks and a simple bass beat of the drums. Wold’s vocals cut through pleasantly, bringing the melody to life. As they put it, “‘Fake It Til You Make It’ is a song about being no one, but still reaching for the stars, and trying to hold on to your joie de vivre.” This song perfectly tackles exactly where the band is in its career – the trio is on the rise, but still holding onto the innocence, hard work, and pure passion that has led them to where they are today. “Black and White” is a wonderful dream of a song. Starting off melancholy slowly leading up to the force that is the chorus. The song musically reflects the lyrics. A fight with a significant other – it can start off slow and unassuming, but more often than not that slow and unassuming start builds up to an ultimate explosion. In toxic relationships these fights can go round and round. The verses represent the calmer moments, while the explosion of the chorus is the ultimate moment of conflict. According to the band, the song “was written about the first fight I ever had with that girlfriend. It’s about the kind of romance where two people who are complete opposites are joined as one, and the push and pull of that.” Perfectly playing off of that push and pull, the song makes us feel exactly what it wants you to feel – a perfect marriage of music and lyrics. “Karma” is the final song off the LAUNCH EP; tracking back to the root of DREAMERS, it is rock focused. It’s a powerful anthem “about the greedy and wealthy people in power who choose to do bad instead of good, and how the world is watching” – a message the world needs to hear today. Distorted guitars and gut-wrenching lyrics propel this song deep into our systems. You can feel that DREAMERS put every ounce of emotion and passion into this track. Choosing to close the EP with it is bold and exciting – leaving listeners feeling like they heard something important, something they needed to hear, and something that should absolutely keep them coming back for more. True to its name, LAUNCH is only the beginning for DREAMERS – whose 2016 debut record, This Album Does Not Exist was an Atwood favorite, and who continue to impress with every subsequent release. The trio will be performing on the festival circuit(s) this summer, fresh off their tour with All Time Low. Their new release can only mean we’ll be seeing a lot more of them, and we can’t wait to see what they do next. For more on DREAMERS, dive into our “SCREWS” song review here! DREAMERS have also shared a playlist exclusively with Atwood Magazine of songs that they’re currently inspired by, including some of the inspirations behind “SCREWS.” Take a listen!